Everyone is entitled to an opinion as to whether Rafael Nadal would complete a “proper” grand slam of grand slams if he spreadeagles the field to land the Australian Open title 15 days from now. What cannot be argued is that a tenth grand-slam title for the 24-year-old Spaniard would be his fourth in succession, and that is extraordinary in any language. Appropriately, he would complete the task on the arena named after the previous man to win four back-to-back, Rod Laver. The gentle man himself has indicated that he thinks a real “grand slam” starts in January in Australia and ends in September in New York City. When the Australian won the second of his four-in-a-year sets in 1969 — his first was as an amateur in 1962 — three of the grand-slam tournaments were played on grass and one on clay. Now, there is grass, clay and two on hard courts, which is the least forgiving of the surfaces. 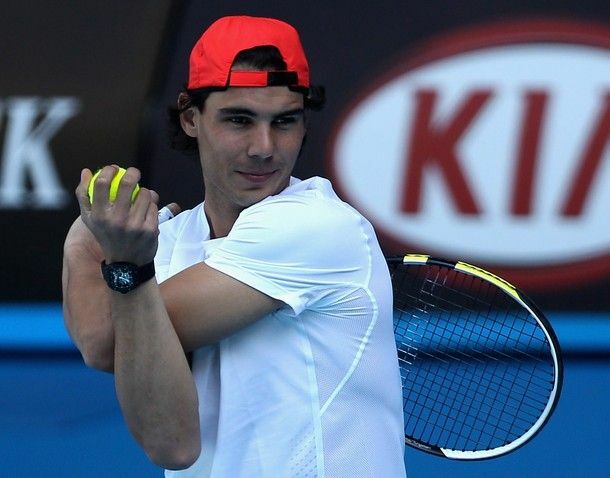 “He’s got three under his belt and he’s playing well,” Laver, 72, said from his home in California. “There’s a good chance he could pull it off. But it’s not a grand slam, certainly. People will say, ‘He’s going for a grand slam.’ And I say, ‘No, he’s not doing that.’ That wasn’t the way the whole thing was set up. A great effort: that is damning with faint praise. Consider all those who have tried and failed in the intervening years. Twice the French Open was Roger Federer’s nemesis and when he did break that hoodoo, in 2009 — and win Wimbledon in its wake — he lost to Juan Martín Del Potro, of Argentina, in the US Open final. Jimmy Connors won three grand-slam tournaments in 1974, but did not play in the French Open, instead fulfilling his Team Tennis obligations, and was beaten in the 1975 Australian final by John Newcombe. Asked why he thought his feat had not been repeated for more than four decades, Laver pointed to the importance of being free from injury and illness and the depth of men’s tennis today. Much as one is loath to argue with such a wonderful player, I believe that Nadal cannot possibly be denied the right to say that he has achieved exactly what Laver did, and the fact that he did it in a different order means nothing. That would be to demean his achievement unnecessarily. And what would be the point in that? “It’s something unbelievable,” Nadal said with a grin at the thought that he could repeat his triumph of two years ago with all the additional pressures that would be brought to bear. “I will play with calm because winning nine grand-slams, 18 Masters, one Olympic gold medal and two Davis Cups, that’s much more than I ever dreamt. If my career finished now, I am more than happy. The draw has been kind. Marcos Daniel, his first-round opponent, qualified for the French Open in 2009 and was beaten by Nadal in straight sets, as he was again at Queen’s Club last year. At No 96 in the world, the Brazilian is a less than fearsome customer on a hard court. Nadal’s first prospective seeded opponent is Feliciano López, a fellow Spaniard and the No 31 seed, who will be too much in awe of Nadal to cause him many problems. Ivan Lendl, back in Australia ostensibly to play golf, visited Melbourne Park yesterday to take part in the draw and made some fascinating remarks about Nadal and his place in history. Lendl was the prototype for today’s overtly physical style of play, as exemplified by Nadal. “I like watching Rafa because I admire how he goes out and says, ‘OK, to win the US Open I need to improve my serve’ and he and his uncle work on the serve,” the Australian champion in 1989 and 1990 said. “It was a great weapon and that’s how you get better, that’s how you separate yourself from the rest. “At Wimbledon he stood closer to the baseline. He’s developed his second serve, which isn’t sitting there any more, and he’s developed his backhand slice. I don’t participate in discussions about how I would have played Rafa, I used to hate it when older guys would say how they [would] play me. That’s only theory. I’m looking forward to seeing if he has learnt something new for Australia. Of course, there is a limit and that’s when somebody else will catch up. “From what I heard about Mats [Wilander], he set himself a goal to become No 1, he became No 1 and lost motivation. That is the importance of adjusting goals, no matter what level you play. Give yourself long-term goals which are right up there and if you achieve those you have done everything. Nadal and his uncle do a lot of right things. Four grand-slam titles in a row is a genuine grand slam to me. Rafael Nadal: "I'm not perfect." I remember many times that I didn't start the tournaments playing well. Then I've been improving, and I've finished playing well. It's hard to say if I'm ready or not. The only that I can say is that I made a good job at the end of the season and I've done everything possible to be ready. 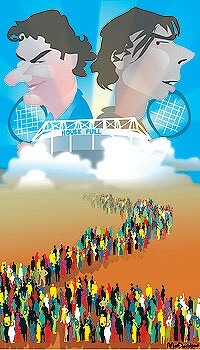 My motivation is the Australian Open. There's nothing bigger. For me the pression is the same in all the tournaments. I wanna play well and do things right. I'm better every single day. I'll be completely fit for next Monday, there's still time y and I don't have already fever. I can improve everything: the volley, the position in the court, to be more inside the court. I improved a lot since last year but is never enough. I'm not perfect, everyone can improve. The weather didn't help a lot that days. The weather has not helped much these days. There's nothing to do, wait and to train in indoor courts. The most important is to be ready for monday or tuesday.